How to throw the most epic dinner party? It’s easy! Just win the Masters! We jest, we jest. But in all seriousness, for those of you who don’t know, winning the Masters entails more than just winning a snazzy green jacket (that only a very select few people have in the world). It also means they fête you the following year, throwing you a Champion’s Dinner the Tuesday before the next Masters begins. And the best part? YOU get to choose the menu! 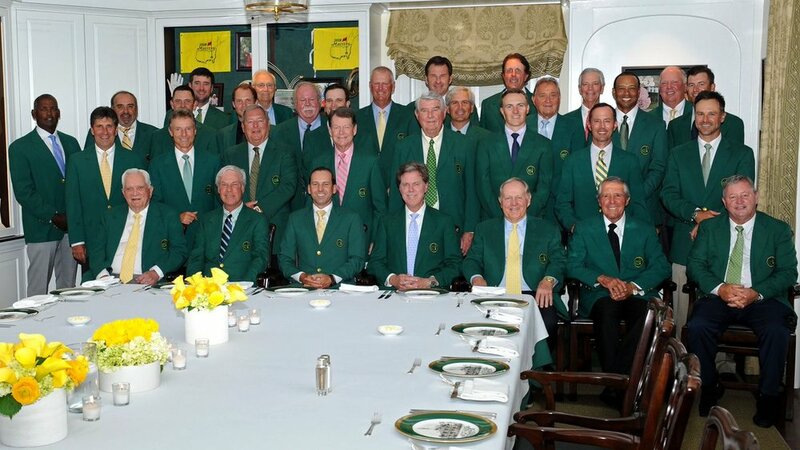 The Champions Dinner has become an annual tradition at The Masters. Since 1952, winning the prestigious Augusta championship has meant an unspoken initiation into an elite and exclusive club—a club that meets but once a year over dinner on the Tuesday night of tournament week. The club is unofficially known as the Masters Club and their dinner gathering, the Champions Dinner. The first dinner was arranged by in 1952 by 1951’s Masters Champion, Ben Hogan. I wish to invite you to attend a stag dinner at the Augusta National on Friday evening, April 4th, at 7:15 p.m. It's my wish to invite all the Masters Champions who are going to be here, plus Bob Jones and Cliff Roberts. The latter has agreed to make available his room for the dinner party and I hope you can be on hand promptly at 7:15 p.m. My only stipulation is that you wear your green coat. The privilege of selecting the dinner menu at this esteemed meeting goes to winner of the previous year’s Masters. He must also pay for producing that menu. And in years past, the offerings have ranged quite a bit from traditional Scottish haggis to cheeseburgers and milkshakes. (Tiger Woods offered cheeseburgers, chicken sandwiches, French fries and milkshakes in 1998. His tastes may have changed since then—he was only 22 then). It’s perhaps interesting if not comical to note that the Masters Club is not required to eat off the defending champ’s menu. They do indeed have an out—they can instead order off of Augusta National’s regular menu, which includes steak, fish and chicken courses. The 2018 Champions Dinner portrait features 2017 winner Sergio Garcia. (We love Bubba Watson—back left—who looks like he is waving. Lol, Bubba)! Sergio’s menu selections were a nod to his Spanish culture. He featured Arroz Caldoso de Bogavante, a lobster rice dish popular in Spain. Dinner attendees were treated to a dessert of Tres Leches Cake, which, believe or not, was Sergio’s mother’s recipe and it was served alongside tres leches ice cream. Featured wines included a 2016 Sketch (Albarino, Rias Baixas) and a 2014 Pinea (Tempranillo, Ribera Del Duero)—both from Spain, of course. Danny Willett (2017): A British meal for a British bloke. This Champions Dinner featured mini cottage pies (like shepherd's pie but made with beef not lamb); a traditional "Sunday roast" of prime rib, roasted potatoes and vegetables and Yorkshire pudding gravy; and for dessert, apple crumble with vanilla custard. Also offered: coffee and tea with English cheese and biscuits and a selection of wines. Jordan Spieth (2016): Jordan’s menu featured a salad of local greens; a main course of Texas barbecue (beef brisket, smoked half chicken, pork ribs); sides of BBQ baked beans, bacon and chive potato salad, sautéed green beans, grilled zucchini, roasted yellow squash; and dessert was a warm chocolate chip cookie served with vanilla ice cream. Bubba Watson (2015): We love Bubba for many reasons, including that he served the same menu that he did in 2013. Adam Scott (2014): Adam served an appetizer of artichoke and arugula salad with calamari followed by a surf-and-turf on the grill main course of Australian wagyu beef New York strip steak with Moreton Bay (“bugs”) lobster. Sides included sautéed spinach and onion cream mashed potatoes. For dessert he offered strawberry and passion fruit pavlova, an Anzac biscuit and a vanilla sundae. Bubba Watson (2013): Bubba kicked off his meal with a traditional caesar salad, followed by a grilled chicken breast course with sides of green beans, mashed potatoes, corn, macaroni and cheese and cornbread. Dessert included a confetti cake and vanilla ice cream. Charl Schwartzel (2012): Charl kicked off the meal with a chilled seafood bar, which included shrimp, lobster, crabmeat, crab legs, and oysters. For the main course, Charl featured a taste of home with braai, a South African barbecue, that included lamb chops, steaks, and South African sausages. His sides included salad, an assortment of cheeses, sautéed sweet corn, green beans Dauphinoise potatoes. Dessert was simple and sweet—a vanilla ice cream sundae. Phil Mickelson (2011): Phil opted for a Spanish-themed menu of seafood paella and manchego cheese-topped filet mignon. He also featured a salad, asparagus, and tortillas. The mean concluded with an ice cream-topped apple empanada. Angel Cabrera (2010): Angel brought with him to Augusta National a taste of his home country of Argentina, featuring asado, a multi-course Argentinian barbecue featuring chorizo, blood sausage, short ribs, beef filets and mollejas (aka sweetbreads). Trevor Immelman (2009): In a nod to his home country, Trevor featured Bobotie, a spiced, minced meat pie with an egg topping, sosaties, a South African chicken skewer, a spinach salad, and South African wines. He completed the meal with a milk tart for dessert. Zach Johnson (2008): Zach’s meal featured American cuisine including Iowa beef and Florida shrimp. Phil Mickelson (2007): Phil went Americana, featuring a dinner of barbecued ribs, chicken, sausage and pulled pork and a side of cole slaw. Tiger Woods (2006): Tiger made the Champions Dinner into a fiesta, featuring a menu of appetizers that included chips and salsa, guacamole, ceviche, stuffed jalapeños, chili con queso and quesadilla; a garden salad; and an entrée course of chicken and steak fajitas with Mexican rice and refried beans. Dessert was good ol’ apple pie and ice cream. Not to be left out—margaritas and sangria (along with some very nice white and red wine). Phil Mickelson (2005): Phil went Italian trattoria-style for this Champions dinner, featuring garlic bread and caesar salads to start followed by an entrée course of lobster ravioli in tomato cream sauce. Mike Weir (2004): It was a Canadian feast for Mike’s Champions Dinner. Club members were treated to elk, wild boar and Arctic char with Canadian beer to wash it all down. Tiger Woods (2003): Tiger revived some of his 2002 in 2003. Repeat menu items included the sushi and sashimi along with the porterhouse steak, chicken, mashed potatoes and asparagus. Even the wines were the same—Far Niente chardonnay and cabernet sauvignon. New to the 2003 menu was a seasonal greens salad with jumbo lump crab cakes in a sundried tomato vinaigrette and a chocolate truffle cake with fresh berries. Tiger Woods (2002): Tiger’s 2002 dinner started with an assortment of sushi and sashimi served with a seasonal green salad and a balsamic vinaigrette. The entrée course consisted of prime porterhouse steak and grilled chicken breasts with sides of mashed potatoes and steamed asparagus. Dessert was a chocolate cake with a ganache filling served with vanilla ice cream. Vijay Singh (2001): Vijay brought some wonderful international flavors to the Champions dinner serving appetizers that included chicken saté with peanut sauce, kung-thod in a chili sauce, and tamarind spring rolls in a tamarind sauce. From there, the Masters Club was treated to a seafood tom kah soup followed by a family-style assortment of Thai entrées including chicken panang curry, baked sea scallops with garlic sauce, rack of lamb with yellow kari sauce, baked filet Chilean sea bass with three flavor chili sauce—all served with steamed jasmine rice and sautéed mixed fresh vegetables. Dessert was a refreshing lychee sorbet. Mark O'Meara (1999): Mark kept it protein-rich with chicken and steak fajitas along with sushi and sashimi. Nick Faldo (1997): Sir Nick featured a British menu of tomato soup and fish & chips. Ben Crenshaw (1996): Ben served up some good ol’ Texas barbecue. José Maria Olazabal (1995): José brought the flavors of home, Basque Country, Spain, with hake, an assortment of tapas and paella (a Spanish rice dish). Bernhard Langer (1994): Bernhard, who hails from Germany, featured turkey and dressing and finished the meal with a German dessert, black forest torte. Fred Couples (1993): Fred’s dinner was a tribute to his roots. His paternal grandparents immigrated from Italy but changed the family name from "Coppola" to "Couples" to make it sound less ethnic. His featured entrée was chicken cacciatore. Sandy Lyle (1989): It comes as little surprise that Sandy, a Scotsman, chose to feature haggis for his Champions dinner. The haggis was served with sides of mashed potatoes and turnips. Bernhard Langer (1986): Bernhard featured a German specialty for his Champions Dinner entrée—wiener schnitzel, which is essentially breaded veal.